Now that I’ve been back in the States for a couple of months I find that some of my well-honed travel habits went AWOL on me and just disappeared without asking me if I was ready to part ways. You see, I never lose anything on the road (truly haven’t left anything behind) yet in the past two months I’ve misplaced sunglasses, wallets, keys, and power cords for sometimes days while I’m living out cozy bedrooms at the hospitality of my friends. In fact, my friends consistently joke that I lose my edge when I’m home, and it’s true – my guard is down and I have others nearby to use as a crutch if something happens. So I ask myself where has the organization gone? I’m drowning in my Type B travel personality without the sprinkling of Type A traits when I’m in the comfort of home. 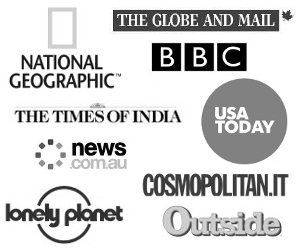 In fact, I find that us travelers are a lax bunch for the most part…perhaps the quintessential Type B-ers: relaxed and patient, we go-with-the-flow and operate with less urgency because of an open schedule. 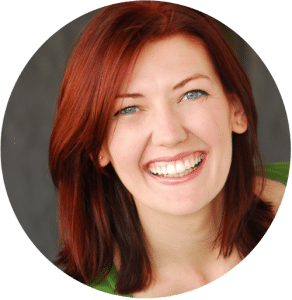 And while there are a lot of negative characteristics to that typical Type A-er, there are a few traits that I’ve found helpful on the road for building habits that keep you sane and organized…and these are the habits that I hope will show back up on the scene before I leave for Asia this month! Keep track of your belongings. You don’t have many belongings anyways but it’s easy to leave things behind when you’re frequently moving so keep good track of what you and have where it goes. My travel habits: I never take off my watch, rings, or other personal effects – instead I just got used to wearing them. For the moments when something does have to come off (my rings for diving/water sports) then have a designated spot and only take it off when I can put it in that spot! Create your packing system…you don’t have many belongings anyways but it’s easy to leave things behind when you’re frequently moving so create your packing system and stick to it! This one goes hand in hand with being methodical – put things back into their place within your system and you’re golden! Having a system and a set place for everything also helps cut down time if you snooze through your alarm and have to throw everything together! My travel habits: Similarly, when I am packing I know if everything is with me because it all has a spot – especially the important stuff. The laptop cord always gets packed in the same spot, same with the camera, my towel (easy to leave behind) and other important items so that I can easily do a “last check” right before leaving. 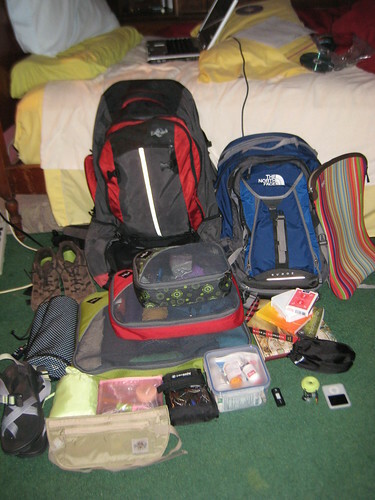 I love using packing cubes and zip-locks…between the two my pack rarely has loose things rolling around inside! 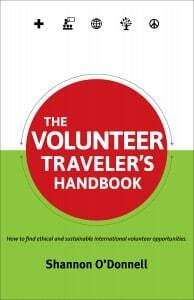 It may be the Boy Scouts motto but it works for travelers too! Traveling is a lot safer than non-travelers imagine but that doesn’t mean that we don’t encounter those rough spots. Scan and photocopy your passport, your credit cards, your vaccine records and anything else important. Bring your own lock for lockers and keep your vitals close on hand as you travel (yep…I mean a money belt). My travel habits: I scanned everything from my social security card to my birth certificate (and definitely my passport) and left it on a drive for my parents – I emailed myself some important documents so that they’re in my inbox. Either way, if I need them someone can easily find them and get them to me electronically. I also travel with a PacSafe – it doesn’t get used all of the time but when it does I am so thankful to have my electronics safe while I go explore. Seems Simple but Makes a Big Difference! I can’t count the number of times I’ve watched stressed out backpackers digging out all of the contents of their rucksack backpack in search of that one essential item they need. Or watched the panic as a traveler realizes their computer cord is 400 miles away still plugged into the outlet in the room at their last hostel. Although there’s something to say for that patience and ease that we’ve all developed from hours spent waiting for that bus that was “coming in 20 minutes, mas o menos” only to get on the bus for another 15 hours, there’s also something to say for the neat traveler who just has their act together a teensy bit more than the rest. What are your top tips for staying organized on the road? Eagle Creek cubes are an absolute lifesaver for backpackers! As someone who has always travelled with them I find it so tough to understand people who don't! I love to be prepared and travelling is the ideal place for it. I especially love the feeling of knowing exactly where all my belongings are so that I can reach in to my bag and pick them out instantly. I'd have a hard time trusting my electronics to the pac safe! I feel better with them in my day pack. I definitely agree it's great to have set pockets for specific items – saves getting halfway down the block and thinking, did I remember my charger? and run, they were actually going to have to work for it! I'm so with you, I don't know how many times I've lost my keys and ID at home. BTW I have never seen the PacSafe mesh before, I wish I had known about it before I left. Great post, I completely agree. I learned a whole new way of packing and staying organized thanks to our long term travels. I'm actually much neater at home now — I find a lot of relief in having a specific “home” for sunglasses and laptop cords. I can't believe that we lost almost nothing during our year of travel, and I probably lost 3 sweaters, countless sunglasses, wallet, cords just the year before in LA. Like you, I tend to get lazier when we are in the States and visiting people. Stuff starts to spread out into different rooms and you just begin to forget things. 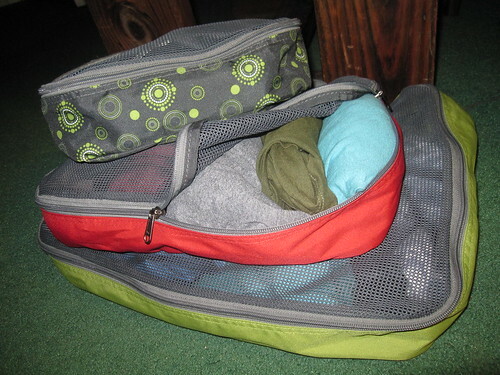 Can I tell you how much I love packing cubes? Everything is in its own colored cube so it makes it both easy to find and also to pack in a second. 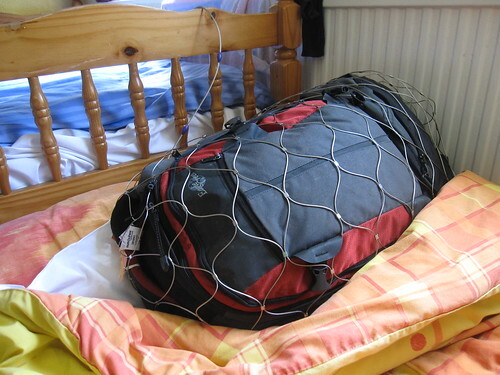 We backpacked in 2000 without cubes and I remember the disaster of my backpack. Now, everything is…almost… neat. I am that girl who rummages through the bottom of her backpack only to find the lock i was looking for in the front pocket of my bag. It blows my mind how I managed to not lose things over several years of traveling. Or I might have already, I just didnt know. :D Thanks for the tips. Oh yes, how I agree with No 2! My packing cells and 'a place for everything and everything in its place' motto has seen me called several things by other backpackers in hostels ('very organised' being the most polite!!) but seriously, I can't recommend keeping all your stuff together enough. It makes life in shared dorms so much easier, and it means you can pack and unpack in only a few minutes. And you never, ever lose anything at the bottom of your bag!! Your first paragraph rings true with me….I am constantly on guard and have all of documents and important stuff at fingertip reach when traveling abroad. I have never lost/forgotten or worse, been robbed on any of my adventures. When I travel closer to home though, you can forget it. 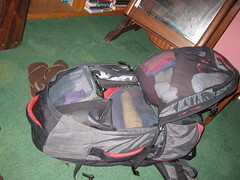 In fact, earlier this year, I went on a weekend trip a mere two hours from home and returned without ANY of my luggage! That's right….I just walked out the door when the weekend was over and left it all in the room!. like our system is working! I know the feeling! Although I don't mind misplacing a few things here and there if it means that I'm a laid-back person as opposed to being someone who is neurotic about making sure everything is in place all of the time. But I will admit that the only way for me to remain somewhat organized while traveling is to simply travel with as few possessions as possible. If I only have thirty things in my backpack, I can count them every time I pack. So far it's worked out quite well, except for the one instance when I left my entire backpack at a guesthouse in India and wandered off to catch a train. Luckily, I realized my odd error before I jumped on board! Great advice!!! If i was ever going to backpack, i think i would take you with me!